A funny thing happened at the studio. 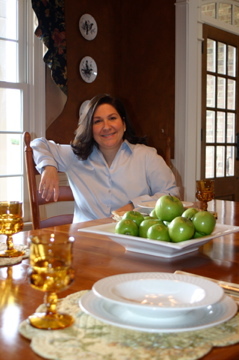 As the culinary contributor for the My Carolina Today show for over a year, it had been about four months since I taped or went live on air. Yesterday was a very exciting day for me because it was my very first day representing BJ’s Wholesale Club as their spokesperson/chef. I awoke very early and headed out for Greensboro, excited to represent a company I have been a consumer of for as long as I can remember. I arrived at the Fox 8 studio and enjoyed meeting everyone. The segment was taped live and went well and as I packed up my things, one of the very nice producers told me that “there was a man out front wanting to meet and speak to me.” They told me that he was asking me if I had a cookbook to sign for him. They even said he thought we were related. Hmm…I was certainly perplexed and being from New England I wasn’t aware of any relatives here in the south and my cookbook Tales of a Well Fed Family has not been published yet, so I certainly did not have a copy to sell or sign. I really wish I had! What in the world was going on? Of all days for my hubby to have a meeting and not be able to join me and now I am being escorted by a security guard to a stranger who claims to be related to me. “You mean he’s not a guest in the green room or someone who works here?” Nope, is all they said. There must be a mistake. Could it be possible that there is a publisher in this town who saw me and thinks my cookbook and personality are a win-win? Is this the break I’ve been waiting and working so hard for? My mind was spinning, but all the while I was thinking – there must be a mistake! With a security guard on one side of me and a producer on the other the lobby doors opened and I saw another security guard sitting next to an older gentleman. The kind man got up as I walked towards him, shook my hand and told me about how we were related and how he came right down to surprise his wife by getting a cookbook signed for her. What a precious husband, I thought. There were two problems however. I knew we weren’t related and I didn’t HAVE a cookbook. The producer, security guard and I all looked at each other perplexed. What in the world was going on? As he began to speak, he mentioned something about “biscuits.” Well, I made succotash not biscuits. 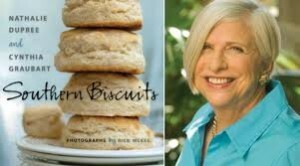 Then I remembered that earlier in the show Natalie Dupree (whom I love) was being broadcast live at a different location selling her new cookbook, Southern Biscuits. …but it was fun imagining that someone would get in their car to meet me after seeing one of my segments. Perhaps there is hope and my cookbook will not just be a dream but a reality someday. A book filled with family recipes, tips and funny and heart-warming stories that everyone will love. A book that will make people smile and continue to spread the legacy my grandmother left behind. Someday…someday it will be on the shelves of the big bookstores with a picture of me and my family gathered around the dinner table making memories! For now I’ll just keep dreaming and working hard, until one day I’ll call my mom and dad and tell them – I did it! 2 Comments on "A funny thing happened yesterday…"
Aw, you’re the best, Lori! Was very surprised to also hear form Natalie Dupree herself. She read my post and sent me a very encouraging email!